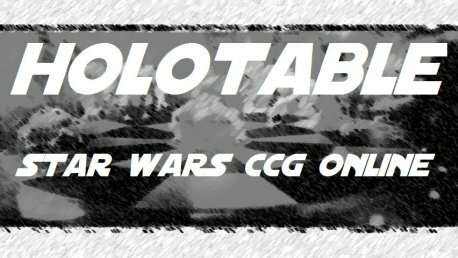 Holotable is the name of a program created from scratch by LtPage2 which allows Star Wars CCG aficionados to play their customizable card game online. Holotable boasts a myriad of improvements over other similar programs, namely, the ability for gamers behind firewalls/routers to play games via a dedicated server (the same server which now hosts this website). The ability to add additional features in the future! This site was created in order to give SWCCG players a place to meet and play this great game online. Originally focusing on a program known as Cardtable, the Holotable launched in September of 2004 with the goal of "ultimately having the most complete database of online SWCCG players on the internet." Subsequent input from the community resulted in the establishment of a permanent server through which players behind firewalls could host and play games. Unfortunately the limitations of the Cardtable program (which was several years old and never updated) prevented the use of the server, which would otherwise have functioned correctly. After several unsuccessful attempts to gain access to the source code, Matt (LtPage2) finally gave up on Cardtable and started work on a brand-new program from scratch. This new program was named "Holotable" and is the focus of this website. The forums here are provided so players can easily get in touch with one another and organize games. Ultimately, we hope to have the most complete database of online SWCCG players on the internet. In the future, The Holotable will (hopefully) run online tournaments, keep players up-to-date with the most current files, and provide pre-constructed decks from current and past World Champions (among others) to the public.